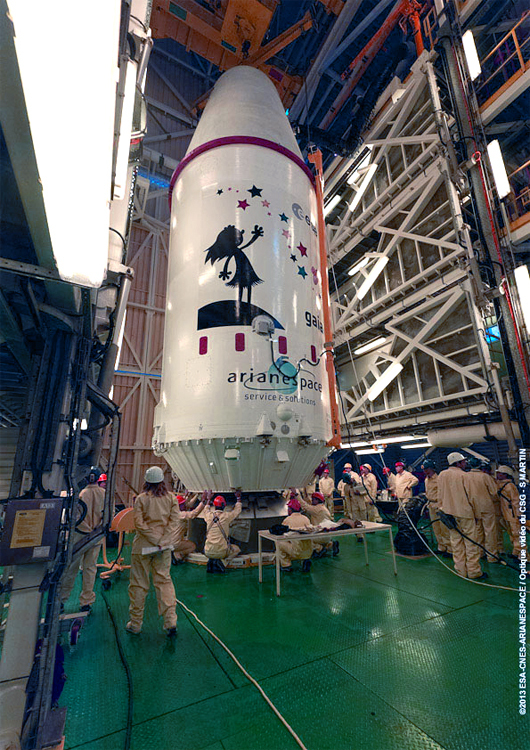 Astrium, the world's second largest space company, has finalised its preparation of Gaia in Kourou, French Guiana. 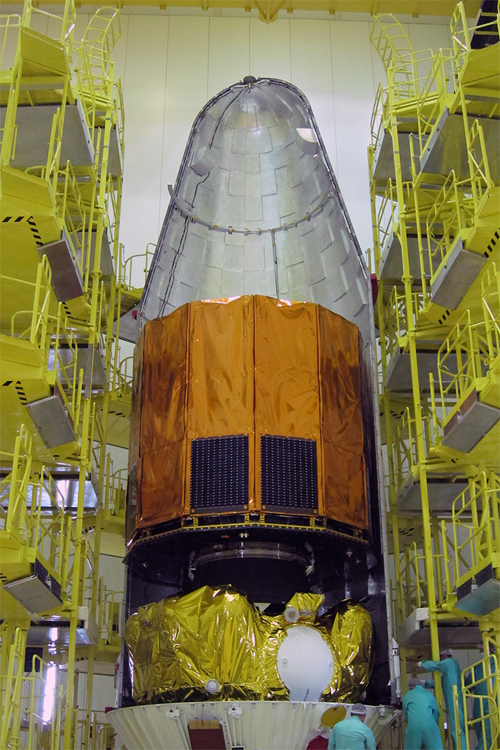 Europe’s most advanced space telescope is scheduled for launch on 19 December aboard Soyuz. Designed and built by Astrium for the European Space Agency (ESA), Gaia will produce a highly accurate 3D map of our galaxy, the Milky Way, and discover and map objects far beyond its boundaries. Its goal is to improve our understanding of the origins and evolution of the Solar System. The Gaia mission is also expected to discover hundreds of thousands of unknown celestial objects, including extra-solar planets and failed stars, known as brown dwarfs. Within our solar system, Gaia will be able to identify tens of thousands of additional asteroids. Gaia will carry ultra-modern instruments, including the most sensitive telescope ever made. Like the space telescope on ESA’s Herschel mission, as well as all the instruments made by Astrium for Earth observation missions, this cutting-edge equipment is the result of unique expertise developed by Astrium in the field of silicon carbide (SiC) telescopes. As part of this remarkable success story, Astrium and its partner Boostec have created a new economic sector through their space-industry achievements. The SiC produced in the French Midi-Pyrénées region is exported around the world. Gaia will also use a ‘photographic’ sensor of unprecedented accuracy. The precision of the measurements taken by Gaia’s optical instruments will be extremely high. For instance, Gaia would be capable of picking out a strand of hair from a distance of 700 kilometres, the equivalent of the altitude of Earth observation satellites, thanks to its huge focal plane made up of 106 CCD detectors gathering 1 billion pixels. For its attitude control, the spacecraft will use a cold gas propulsion system (nitrogen) with micro-thrusters, enabling it to remain perfectly stable and point with the required extreme accuracy. Gaia will be located at one of the five Lagrangian points in the Sun-Earth system, at the L2 point. The Lagrangian points in our solar system are points of gravitational balance where a body such as a spacecraft orbits around the Sun at the same rate as Earth, thereby remaining in a fixed position relative to the Earth-Sun line. Located 1.5 million kilometres from Earth, these points are vital for astronomy observation missions, which require high pointing stability. 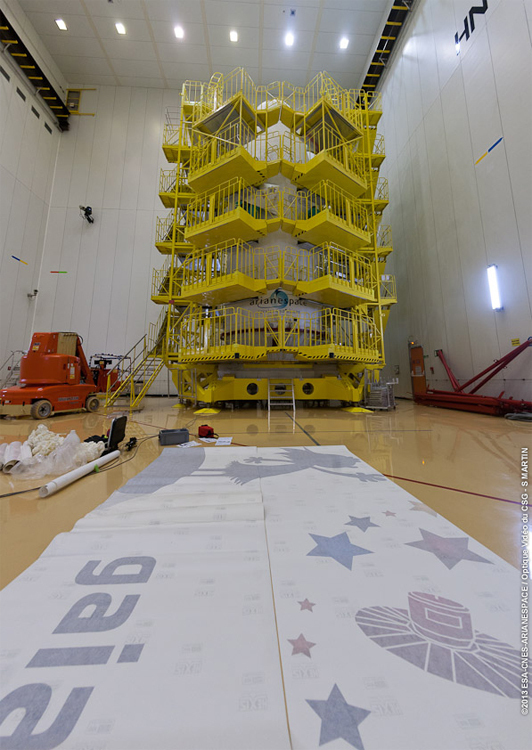 Final payload preparations for Gaia are shown in the Spaceport’s S3B clean room at French Guiana. The first of two payload fairing segments has been positioned around the spacecraft and its Fregat upper stage. 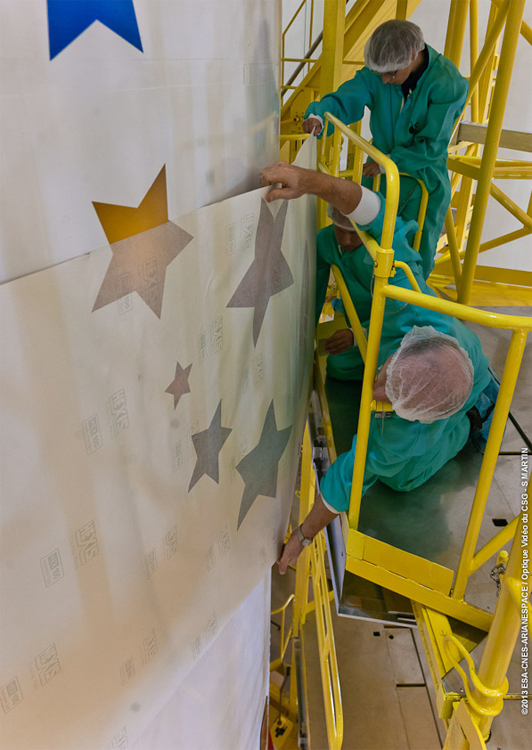 The 3.5-meter-tall decal with Gaia’s mission logo is positioned on the floor, while the pictures at right show its installation and the final result. Europe’s Gaia spacecraft – to be lofted by Arianespace next week on a mission to map the Milky Way – has “seen” its initial stars with the spacecraft’s encapsulation in the payload fairing during final preparations at the Spaceport. 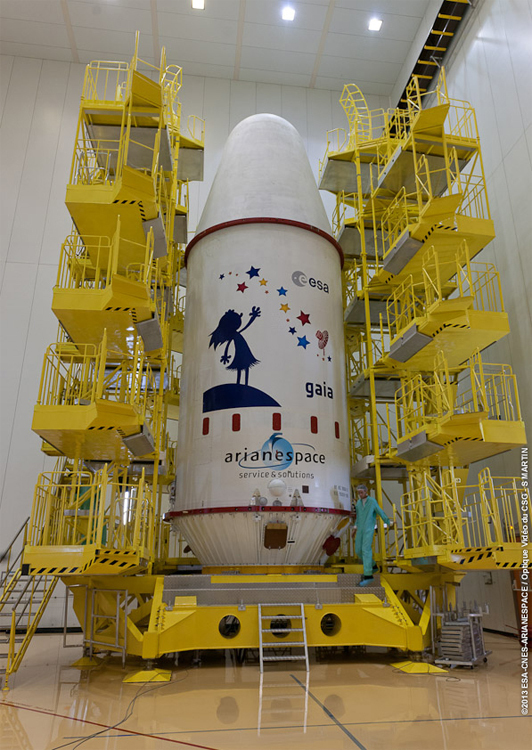 The 11.4-meter tall payload fairing will protect Gaia during its initial ascent aboard Arianespace’s medium-lift Soyuz launcher, which is to lift off from French Guiana in the early morning hours of December 19. This fairing has been adorned with the European Space Agency’s logo for the deep-space flight – a 5.5-year adventure to observe one billion stars in the Milky Way approximately 70 times each. Featured on the graphic is a representation of Gaia – the Greek mythological Mother Goddess, creator and giver of birth to Earth and the Universe. She is depicted looking at the Milky Way as the Gaia spacecraft makes its way through space, symbolizing humankind’s curiosity towards the Universe. 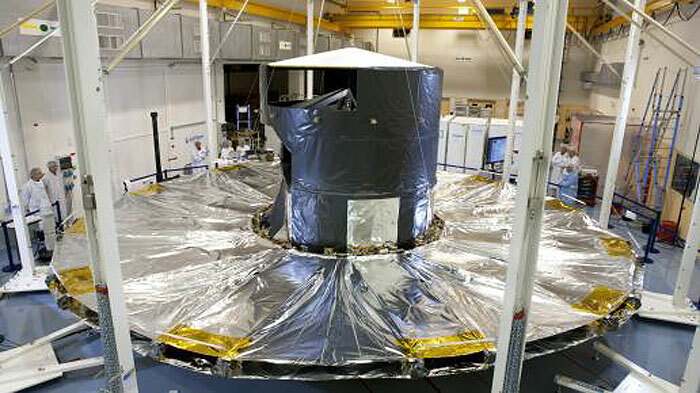 Gaia’s encapsulation in the two-piece payload fairing occurred inside the Spaceport’s S3B clean room facility, enabling this completed unit’s subsequent transfer to the launch pad once its Soyuz vehicle has been rolled out and erected. The Astrium space unit of EADS produced Gaia under contract to the European Space Agency. 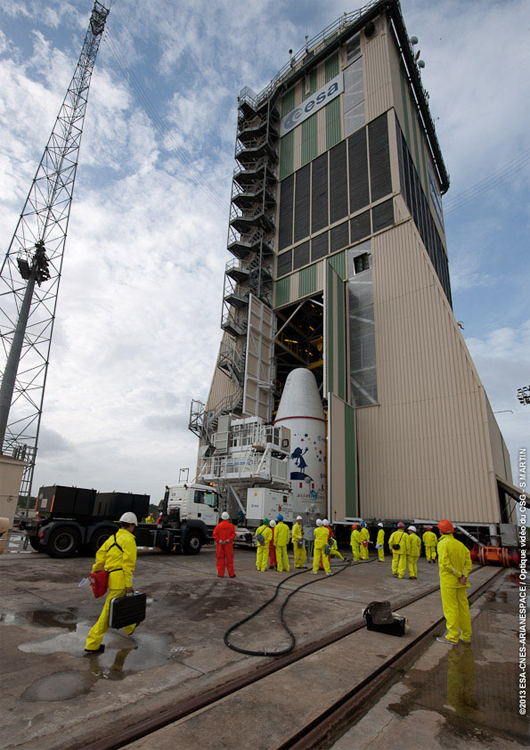 With a liftoff mass estimated at 2,034 kg., it will be the 25th scientific satellite launched by Arianespace.